An easy to use software to create your photo cards in a minute. Choose from templates, and add your own pictures and text. With it, you could turn your pictures into announcements, invitations, holiday cards, and more, all by yourself. Freeware! 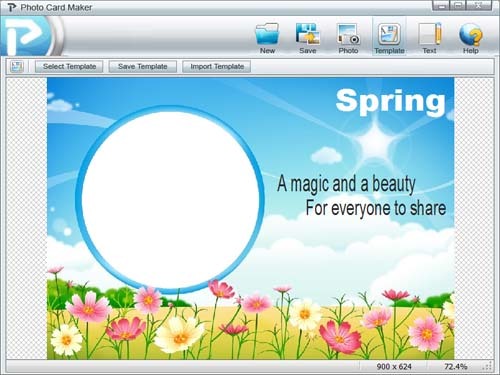 Kigo Photo Card Maker is an easy to use software to create your photo cards in a minute. Choose from a variety of professional templates, and add your own pictures and text. With it, you could turn your pictures into announcements, invitations, holiday cards, and more, all by yourself. You could easily create holiday photo cards, photo cards, Christmas photo cards, photo greeting cards, photo holiday cards, holiday photo greeting cards, personalized family photo cards with it. It's totally free!We supply about 100 templates, and there will be more&more templates on our website for all occasions. You could download them and import into your PhotoCardMaker. And the template is free, too. * First of all, Kigo Photo Card Maker is a totally free ware. * Very easy to use. You could make a photo card within a minute all by yourself. * Hundred of templates available, and more will be provided. * More fonts available to be used on your card. * All operations could be finished with your mouse.